Next Spinach and Green Garlic Soup. 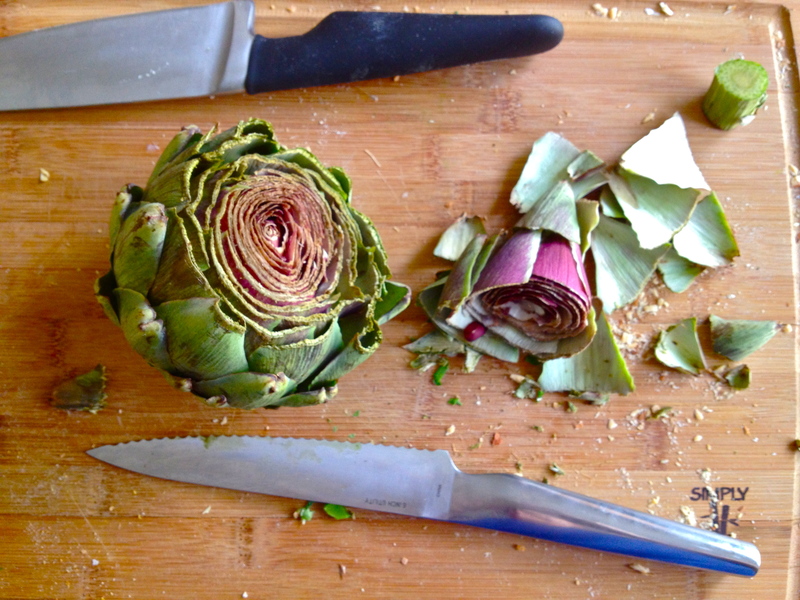 At my house we have been eating Artichokes at least once a week and always wonder (out loud) the same thing. Who decided this was a good thing to eat? Not sure but I am so glad someone did! 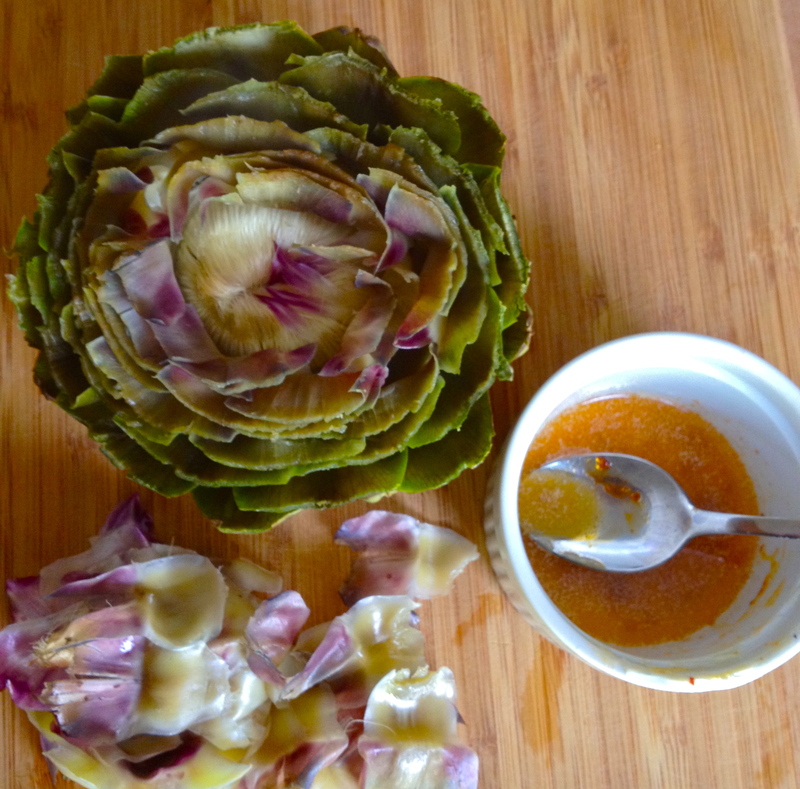 I love this sauce idea—something other than the tried and true hollandaise. THANKS! Can’t wait to try it. 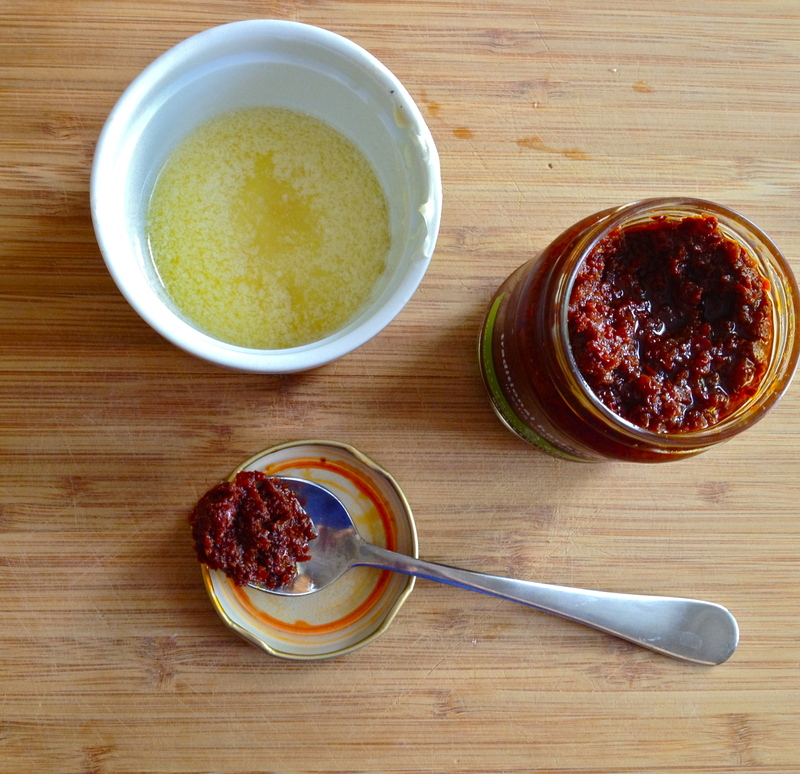 Now…where to get Harissa paste in the burbs…. Love it Kel! It’s a little bit spicy, so if you do get some harissa, go light at first and see if you guys like it! Mmmmm. The anthropologist in you was working away on this one. THe literary genius was busy too but your creative genius was roaring into action as well Then there is the culinary genius who started it all… Really Kelly —- so many parts of you get all rolled into one…..you never cease to amaze me. Love you too, Nana! Tea and breakfast asap! 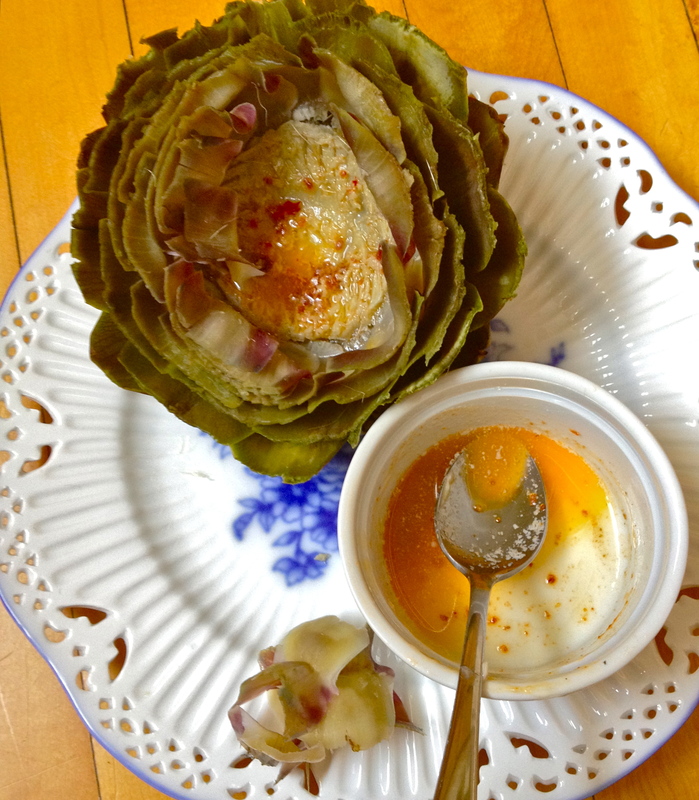 I like the idea of hollowing out the artichoke and putting the sauce directly in the heart. I will definitely be trying this–maybe with Sriracha instead of harissa, since I always have it on hand. Love Sriracha! That would be delish too. Yes the hollowing is key haha. I love that exposed heart, sooo good. Food porny, even. 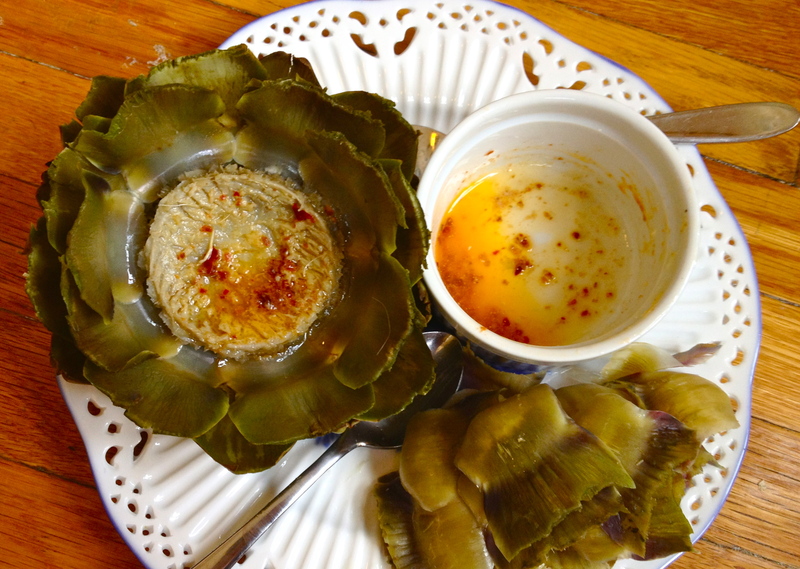 I haven’t indulged in the glory of artichokes for far too long. Time to artichoke I think! 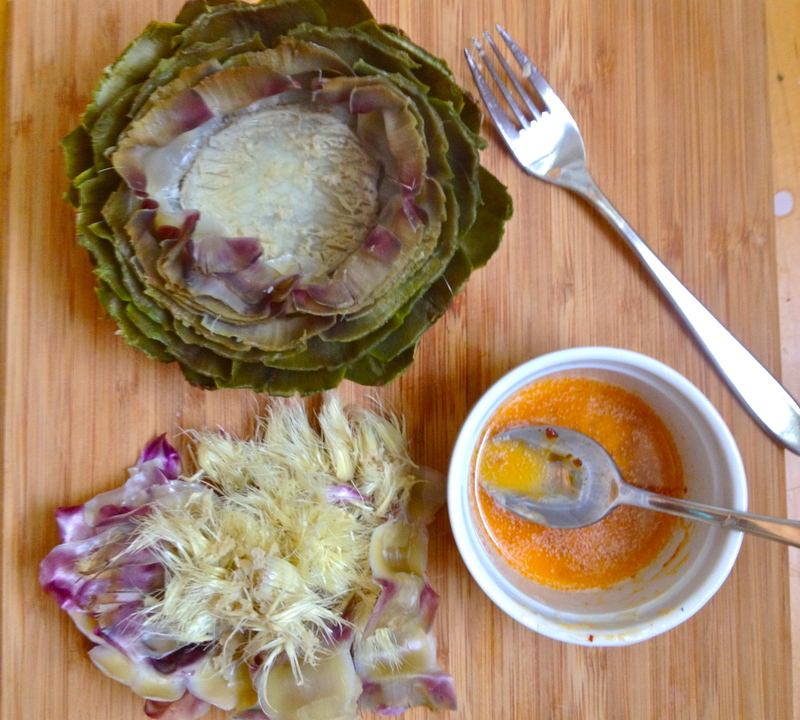 I find I’ll forget about artichokes for a while, and then when I rediscover them, it’s like a honeymoon. I have 3 more in my fridge right now!